2018-02-07 Translator, writer Aram Arsenyan is the guest of "Artbox"
Karen Avetisyan Hosts Translator Aram Arsenyan to Talk about "To Kill A Mockingbird..." by Harer Lee. The Armenian translation of Harry Potter and the Chamber of Secrets - the second volume of Harry Potter series is already out in bookstores. Watch the book release video here. The name of 2016 Nobel Prize winner has become known now – it’s American song-writer and singer Bob Dylan. The decision of the Swedish Academy’s board came as surprise for many readers and ignited hot debates and clashes of opinions among writers and literary critics. What means Nobel prize to an author, how exactly it contributes to the development and popularization of literature and how Armenian publishers view this prize. These questions were the key topic of discussion between literary critics Hayk Hambardzumyan and Artur Mesropyan – the Translations Program Coordinator of Zangak Publishing House. 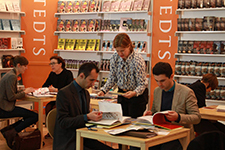 During Frankfurt International Book Fair 2016 held on 19-23 October our latest titles – both adult and children’s were presented along with other Armenian publishers’ literary produce in the Armenian Stand. As a result of more than hundred meetings with our partners from around the publishing world we received about 200 offers collaboration projects the best ones of which are currently going through the sifting process of selection by our editors. This short video features Harry Potter and the Philosopher's Stone Armenian edition release-celebration organized with Khnko Aper library on June 1.